US, 1988, 121 minutes, Colour. William Hurt, Kathleen Turner, Geena Davis, Bill Pullman, Amy Wright, David Ogden Stiers, Ed Begley Jr. 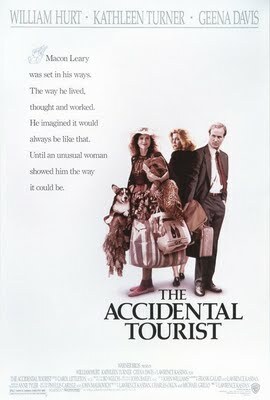 The Accidental Tourist is based on a novel by Anne Tyler. It was adapted for the screen by writer-director Lawrence Kasdan (Body Heat, Big Chill, Silverado as well as several Indiana Jones stories). The film was nominated for Oscar for Best Film as well as for supporting actress Geena Davis and John Williams' musical score. The film is a portrait of eccentric characters and their interactions. It is quite an engaging film, with William Hurt offering a very good performance, a more passive style which suits him. Geena Davis is excellent. Amy Wright, who usually portrays eccentrics (Girlfriends, Wise Blood) is very good as Hurt's sister Rose. 1. The impact of the film as drama, character studies? Nominations for awards? 2. A piece of Americana, Baltimore settings, eccentric characters and families, details of ordinary life, the poorer parts of the city? The overseas sequences for comparisons? Atmospheric score? 3. The title, the credits with the suitcase and packing, Macon and his commentary? The Accidental Tourist books, Macon as a tourist, tourist guide? A metaphor for life? Life as a tour: advice, detached, coping? The voice-over and style for the excerpts? Macon and his exactness as a tour guide, ploys? The irony that they didn't work? Having to change them? 4. William Hurt as Macon: character, a tourist, packing his case, on the plane and his ploy about the book not succeeding? Pleased with admiration? At airports and comments? His wry comments about travel? In London testing accommodation, meals, American meals, toilets, etc? In Canada and the snow? Paris and things going wrong? 5. Macon as a man, detached, 'muffled' as Sarah remarked? His flights, meeting Sarah, her decision to ask for a divorce after 18 years? The death of their son and its effect? Alone, his dreams of his son? Taking his dog for a walk, its needing to be kept? The oddball encounter with Muriel, listening to her, not listening to her, resisting? Her training the dog and giving him skills? Going out with her? Listening to her remarks, afraid to go out, the invitation, the letter of refusal, his delivering it? His apprehension about Alexandra? Going to the house, her gentleness, the night? His staying and its effect on him? An education for him? Going shopping, the movies, defending Alexander from the schoolboys? His concern about his education? Muriel's demand about commitment? His own family and their eccentricity, their selfishness and his selfishness? Julian and his work, love for Rose? The ploy about the Turkey on Thanksgiving Day? The wedding, his advice to Julian to invite Rose to be in control? Meeting Sarah, their relationship starting again, trying? Sarah's comments about the trouble with him ... ? Hurting Muriel? Sarah going back to the house, the set-up? His going to Paris, Muriel on the plane, her vivacity? His back problems, ringing (as he had done from other places)? Sarah's arrival, setting him up, the break - and his puzzle 'Who am I with people'? His getting the taxi and the vision of his son? Meeting Muriel again? A future? 6. The portrait of Sarah: the marriage, the death of their son, the divorce? Her wanting to be on her own? Her reflection on herself, on Macon's character? Her absence from the film until Rose's wedding? The return to the house, the collage of phone calls, her trying to set things right again, the questions about fidelity? Her comments about the trouble with Macon ... ? Going to Paris, trying to reconcile? The inevitability of separation? Her accepting this? 7. Muriel and her impact, chatter, dress, appearance, talking to Macon about the dog, her skills with training? Information? Her friendship with Macon, the attraction? Inviting him to dinner, his refusal? Inviting him into the house, her tenderness? His leaning on her? The sequences together: movies, concern about the schooling and his commitment? Her wanting a father for her son? The wedding, Sarah? Hurt? Challenging Macon about his future? Going to Paris, enjoying it, shopping? Her joy at seeing Macon at the end? A future? 8. The portrait of Alex - and the contrast with Macon's dead son, his illnesses and allergies, shopping, teaching him the plumbing, helping him with the fight with the boys, at the movies? Concern about his education? A chance to become a father again for Macon? 9. Julian and his work, living in the singles building, love for Rose, the humiliation at the Thanksgiving dinner, the wedding, Rose moving out to her brother's, Julian's concern and the advice from Macon to invite her to work for the firm? Rose and her love for Julian? 10. The portrait of Rose, her place in the family, the older brothers as boys, in a groove, looking after them, feeding them, the turkey at Thanksgiving, their callousness, towards her, her love for Julian, the wedding, her decision to go back to the boys, her enjoyment of her role at the office and arranging things for Julian? 11. The sketch of Macon's brothers, their eccentricities, age, getting lost, not eating properly, interactions with people, Rose looking after them? 12. The importance of the dog, for Macon, for the training? Against Julian? 13. A film of values: marriage, break-up, divorce, fidelity and infidelity, commitment? Detached attitudes towards life? The tourist on the journey?